John Williams. 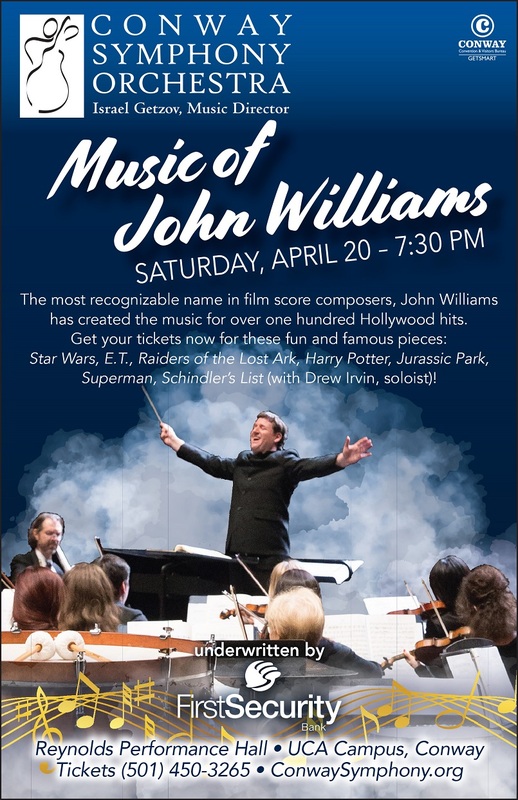 The name brings to mind hundreds of films, from “E.T.” to “Star Wars,” “Superman” to “Harry Potter.” Concert-goers can hear many of them at 7:30 p.m. Saturday, April 20, when the Conway Symphony Orchestra brings this music close to home. The concert will be presented at Reynolds Performance Hall, 223 Beatrice Powell St., at the University of Central Arkansas. Tickets are available through the UCA Box Office at 501.450.3265 for $5 for children/students; $10 for UCA faculty/staff; $20, $30 and $38 for adults. Adult tickets only can also be purchased at ConwaySymphony.org. The CSO will have hosts for the evening, who will introduce the film music. The orchestra will be joined by UCA President Dr. Houston Davis, Jamie Gates of the Conway Area Chamber of Commerce, Amanda Horton of Reynolds Performance Hall, Kim Lane of the Conductor, Hendrix College President Bill Tsutsui and Emily Yates of Coldwell Banker. All are very excited to be a part of the special night! In addition, there will be cash prizes for a costume contest, held at intermission. All guests are invited to wear a special costume, and parade across the stage during the first 10 minutes of intermission. To be considered for a prize, sign up in the lobby before the concert begins. This concert is underwritten by First Security Bank, with hospitality support from Aramark.